"Has a full screen top and a front window vent for top ventilation and airflow to keep the space evenly warm." "Use the suctions cups to attach it to the side of your bearded dragon’s living space." "The bulb has a red tint and helps to increase the overall air temperature in a reptile terrarium to keep them happy and healthy." "Contain a high amount of calcium (for proper bone growth), plus protein, fat, and fiber to keep your bearded dragon’s digestive system running smoothly." "The harness is easy to adjust with a wide opening to slip over your dragon’s head." "The blend retains heat nicely, doesn’t have added dust or smells, and is soft and malleable for when your friend wants to dig and burrow." "Comes in neutral, natural colors to mimic rocks and has two bowls (a deeper dish for water and another one for food) that stack nicely into each other to save space when one isn’t being used." "Set up is easy with eight panels to configure as you see fit." "The ramps come in two shapes: a platform for a corner of the terrarium, as well as a bridge to the middle of the enclosure." Give your bearded dragon a lovely living space with the large, wide Exo Terra Terrarium. The all glass enclosure has a surface space that is 36" x 18" x 18". It has a full screen top and a front window vent for top ventilation and airflow to keep the space evenly warm. On the top screen, there are inlets to securely attach wires to heat lamps and other features. The enclosure also has two doors that open separately to make feeding easier, as well as a waterproof and leak-proof base (in case you want to create a water feature below the window vent) and a natural-esque rock background. Terrariums include a variety of sizes, including small-tall, small-wide, large-tall, large-wide, and mini-wide. Let your bearded dragon hang out, literally, in the soft nylon Zoo Med Mesh Reptile Hammock. Use the suctions cups to attach it to the side of your bearded dragon’s living space (the suction cups stick to glass, plastic, or acrylic). For the best placement, hang the hammock up in a corner. Place it at a low enough level for your bearded dragon to climb into, or use it with a lizard ladder to promote climbing (sold separately). The hammock is 17.5" in length. The smaller size is 14.5" in length. 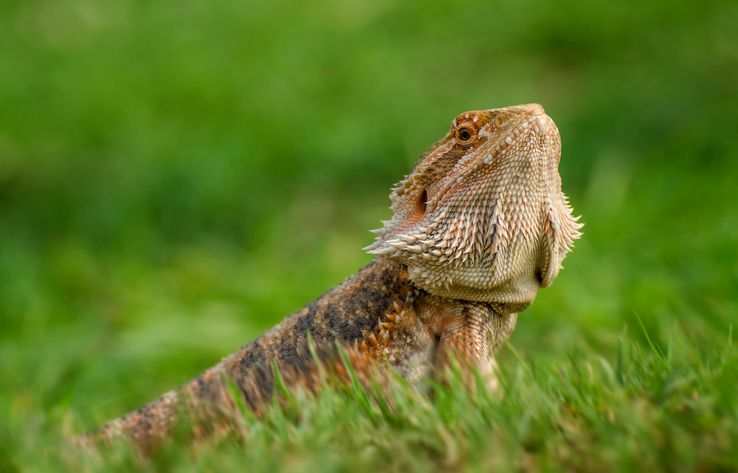 As a cold-blooded reptile, bearded dragons need outside heat sources to stay warm. Plus, one of their favorite activities is to bask in the warm sun. Use the Exo Terra Heat-Glo Infrared Spot Lamp to provide an even, 24-hour heat source for your lizard. The bulb has a red tint and helps to increase the overall air temperature in a reptile terrarium to keep them happy and healthy. Available in 50-watts, 75-watts, 100-watts and 150-watts. Spoil your little guy with delicious and healthy treats, like crickets (yum!). The freeze-dried crickets from Fluker’s contain a high amount of calcium (for proper bone growth), plus protein, fat and fiber to keep your bearded dragon’s digestive system running smoothly and their overall growth on track. Use these as treats or add them to their regular veggie meal for a high-protein supplement. Available in 1.2- ounce packs. Bearded dragons can be quite fast, so if you fancy a walk with your pet, use the Adjustable Reptile Leash Harness by My Reptile Rocks to keep them from scurrying off too quickly. The harness is easy to adjust with a wide opening to slip over your dragon’s head and then cinches tight with the movement of the closure system. Sizes include a three-foot-long leash or a six-foot-long leash. Colors include black and red, black, neon green, purple or neon blue. Once you’ve got a terrarium for your bearded dragon, you’ll have to fill it with material that your dragon enjoys, and one that mimics a desert environment. The sand from Zilla uses natural ground English Walnut shells to create a feel and look that is similar to your bearded dragon’s native environment. The blend retains heat nicely, doesn’t have added dust or smells, and is soft and malleable for when your friend wants to dig and burrow. The material is available in a 5-, 10-, or 25-quart bag. Use the Zoo Med Combo Reptile Rock Food and Water Dish to keep your dragon hydrated. The combo comes in neutral, natural colors to mimic rocks and has two bowls (a deeper dish for water and another one for food) that stack nicely into each other to save space when one isn’t being used. Opt for the small or medium-sized dishes for a bearded dragon’s cage. Other sizes include small (5"), medium (7"), large (11"), and extra large (13"). For extra space to explore and exercise, use the MidWest Homes For Pets pet playpen with your bearded dragon, inside or outside. The foldable playpen comes in a variety of heights, but choose the 24" or the 30" pen for your dragon. Set up is easy with eight panels to configure as you see fit. Always keep a watch on your dragon in the playpen, in case they figure out how to sneakily climb out. Basking in the sun is a favorite pastime of bearded dragons, so add the Zilla Basking Ramp to their living space. The ramps come in two shapes: a platform for a corner of the terrarium, as well as a bridge to the middle of the enclosure. Both shapes come in small and large sizes, and have steps that lead up to a wide, flat surface. Your dragon will get to not only rest on top but also practice their climbing skills.